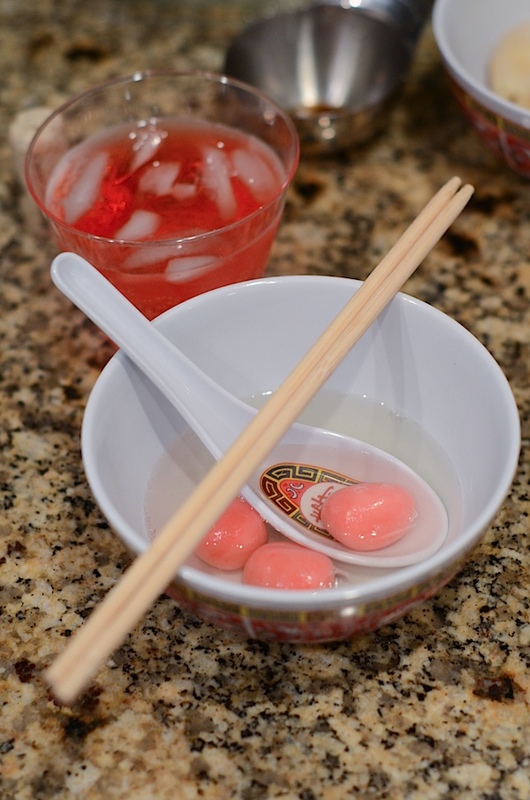 Did you do anything fun for Chinese New Year? 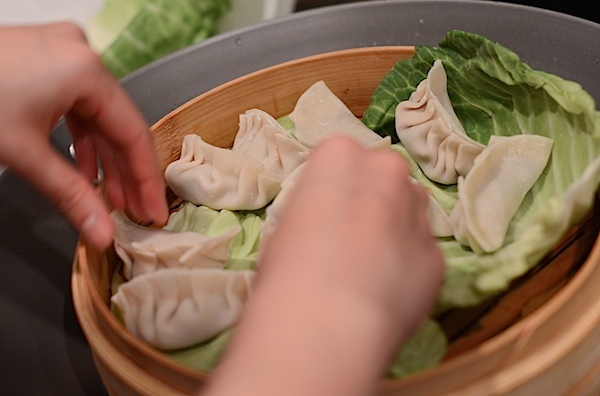 Hubby and I usually try to get dim sum every year, but this year, we did something even better. My friend Briana invited me over for a hands-on Chinese New Year party at her house. 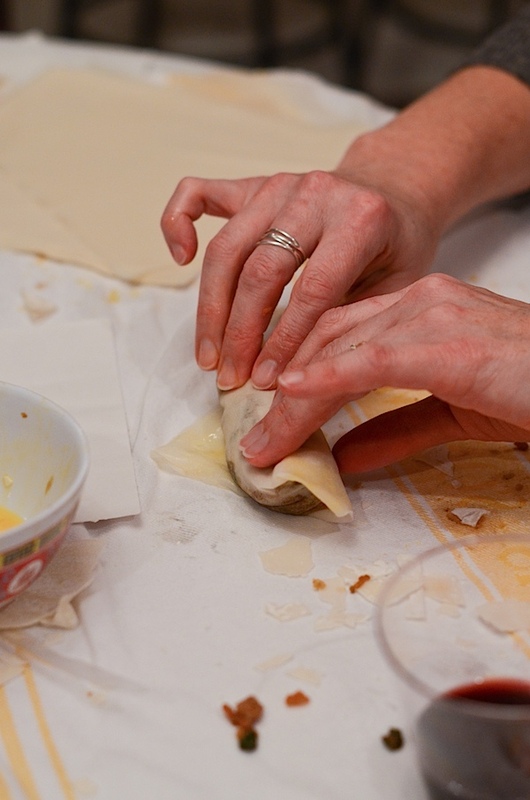 The plan – prepare her family’s recipes and learn how to fold dumplings and egg rolls and make other traditional dishes. When I arrived, Briana was frying up shrimp chips. 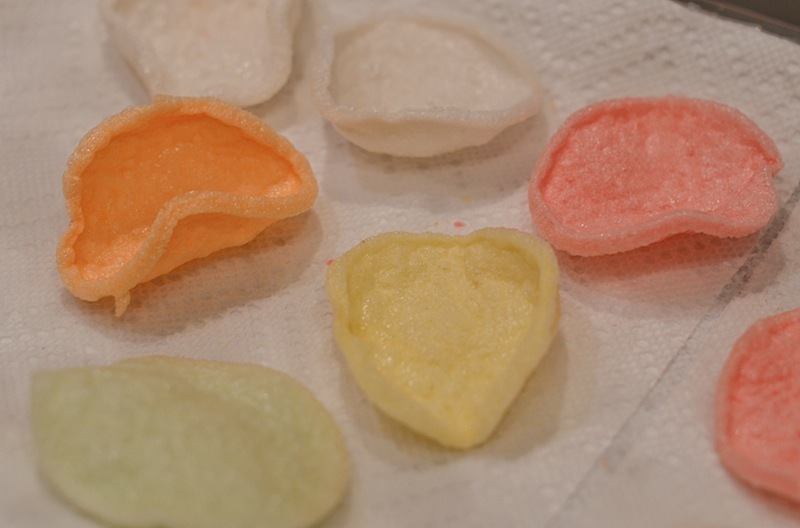 The colorful discs are small and thin when they come out of the box, but they puff up to at least four times their original size as they fry in oil. 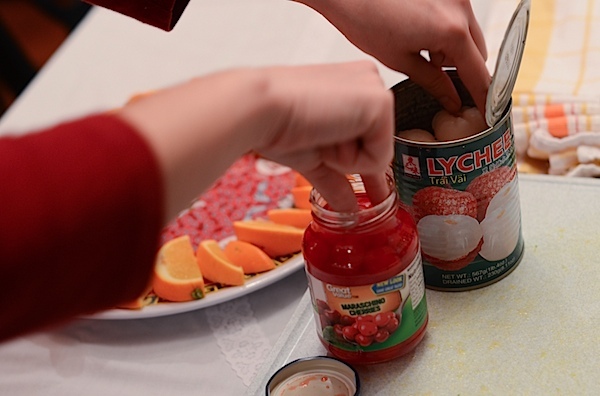 The fruit platter was easy to put together – just add sliced oranges and stuff cherries into lychee fruit. 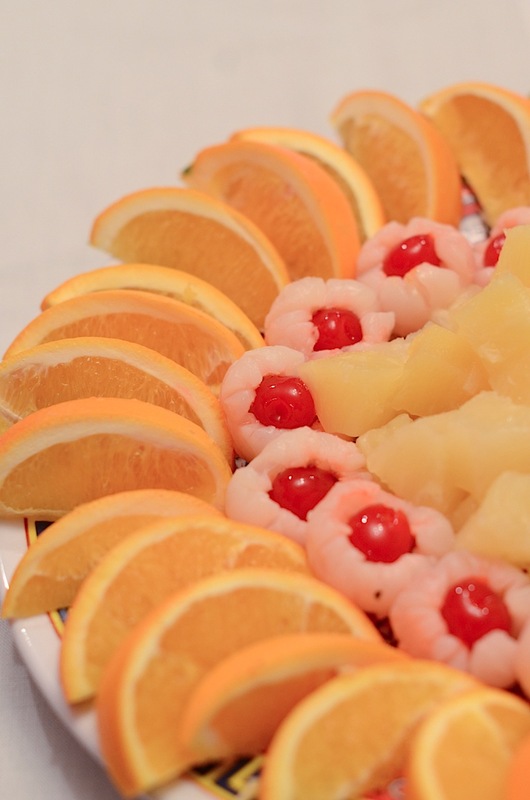 With pineapple added to the center, the simple fruit platter was beautiful and colorful. The oranges are said to bring wealth and good luck. 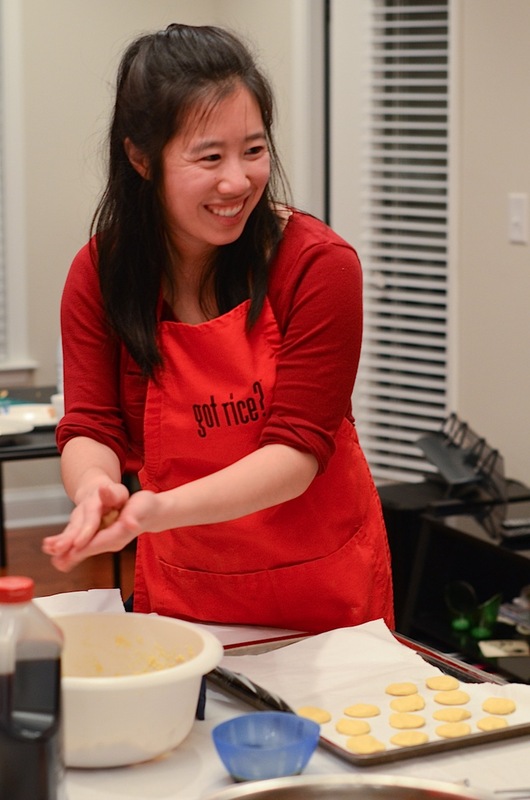 After some snacking and gathering, Briana kicked off the real hands-on fun with the party. 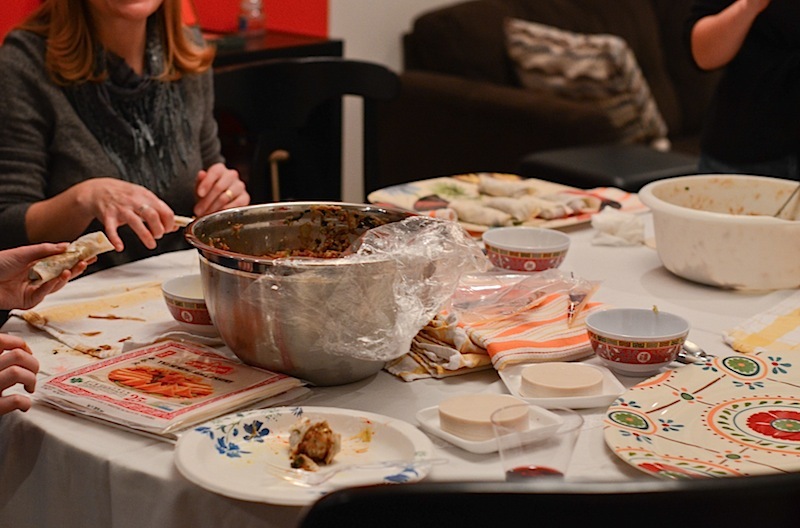 The dining room table was set-up for dumpling and egg roll making and most of the guests found a seat there. 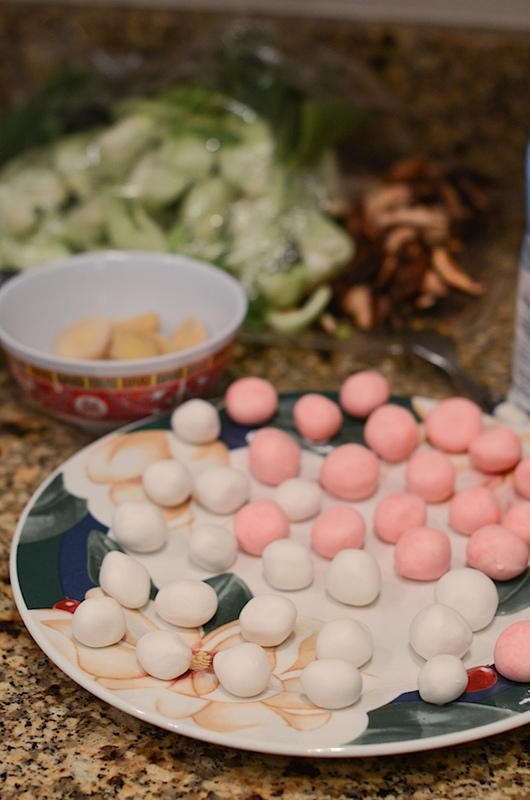 I headed into the kitchen to learn about Tang Yuan. I’d never seen anything like it, so I was really curious to see what it was about. 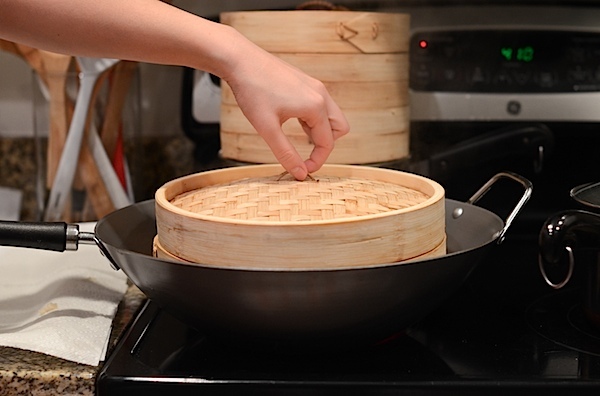 Glutinous rice is used to make a dough that is rolled into balls and then boiled till they float. 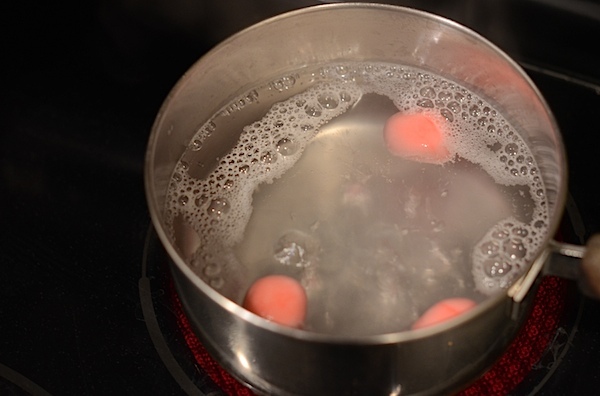 Next, the dough balls are cooked in a sweet broth made with pandan leaves, ginger, and sugar. The soup is more like a dessert, but I didn’t mind eating it first. It’s always a good time for dessert! 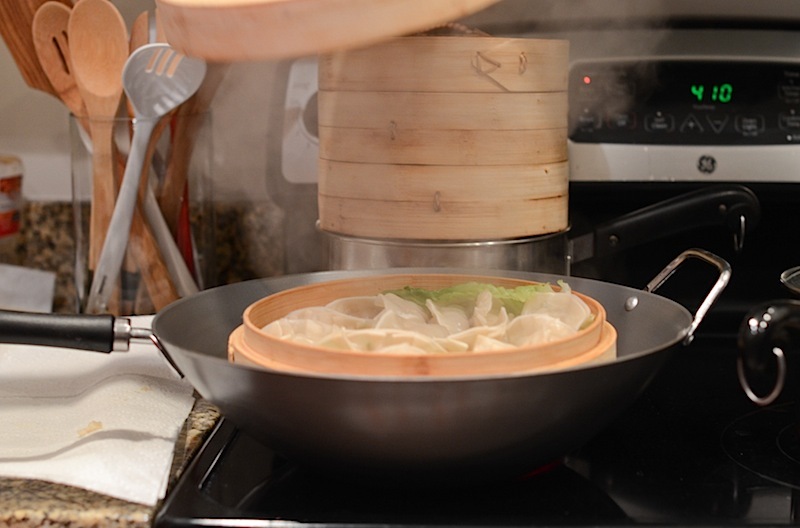 Nothing like freshly steamed dumplings. Briana said the dumplings are shaped like coins to symbolize wealth. I was curious about the coin shape reference since they don’t resemble the round shape of coins I’m familiar with, but this article mentioned that the shape is like ingot-shaped coins or yuanbao. 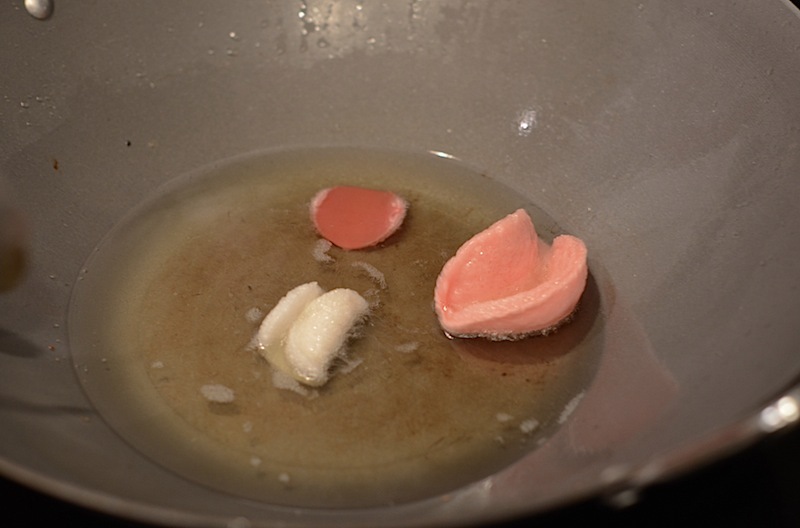 These were served with a simple sauce of soy sauce, vinegar, fresh ginger, fresh garlic, and green onion. 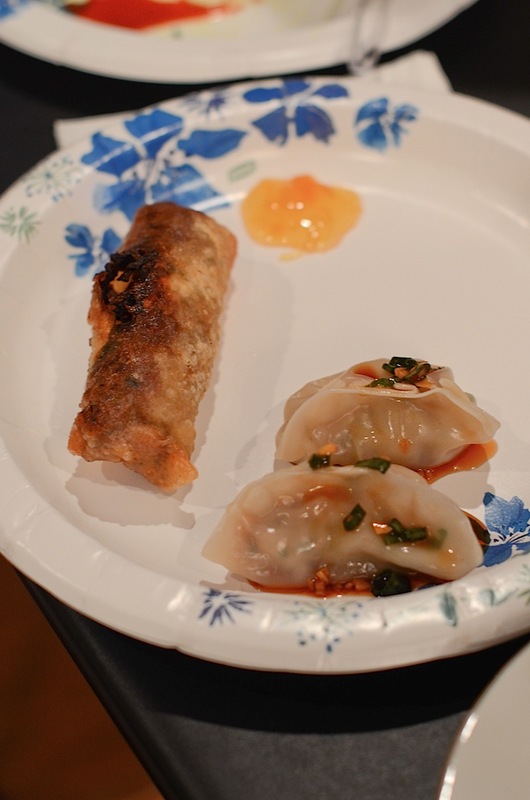 The dumplings and egg rolls were gobbled up almost as soon as they were cooked. They were both so great! Lucky for us, the group had prepared tons of food. 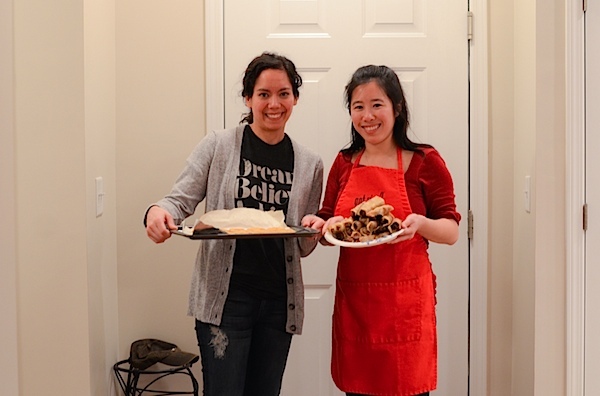 And while batches and batches of Chinese New Year eats were prepared, cooked, and served, we got to enjoy good company from the fellow guests. Also not pictured, we had even more delicious eats that Briana prepared and other guests brought – fried taro root cakes, noodles, kimchi, Filipino sweet rice (that I brought), and Chinese BBQ chicken wings. By the way, I learned from Steamy Kitchen that the egg rolls also have symbolism since they are shaped like gold bars and thus are said to bring wealth. 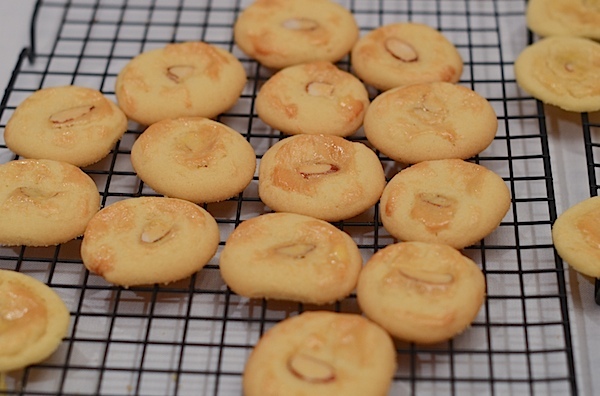 After we’d stuffed ourselves on (mostly) savory eats, Briana got started on dessert #2 – Almond Cookies! Briana said she liked to make her cookies a little smaller than normal. They were pretty much bite-sized, and you couldn’t help but want to snack on them like chips. 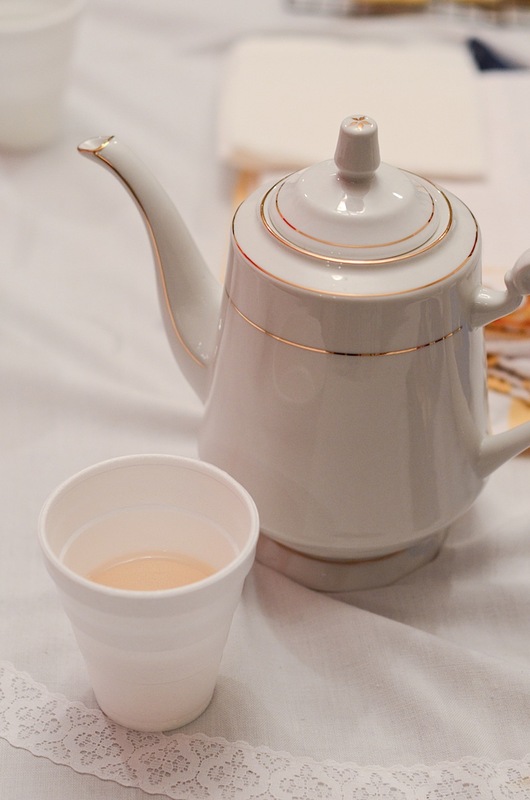 And don’t forget about the tea! Thank you to Briana for opening up your home to us and sharing your family’s traditions! We had a blast! That was such a lovely write up! Thank you for capturing the evening so beautifully! I don’t think anyone left hungry! Glad you liked the post! We definitely left happily stuffed! 🙂 Thank you again! I’m super jealous. All that food looked really good! 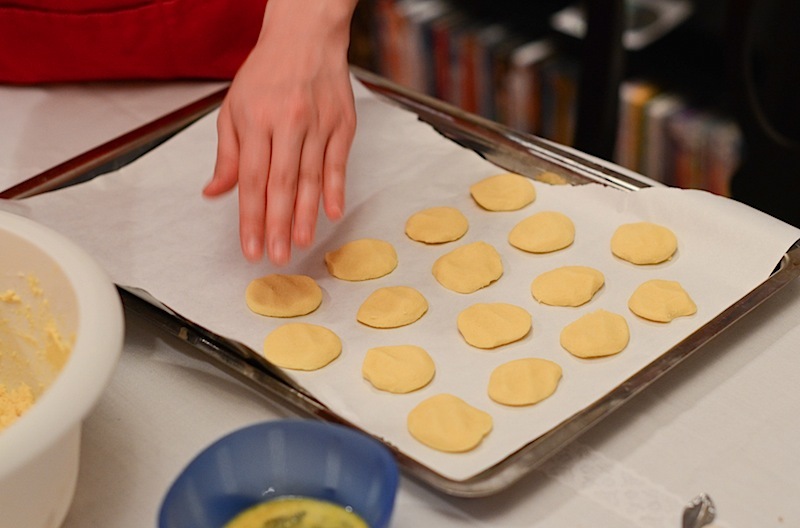 And the dumplings were so pretty! It was! 🙂 We can try to re-create it sometime? lovely post! 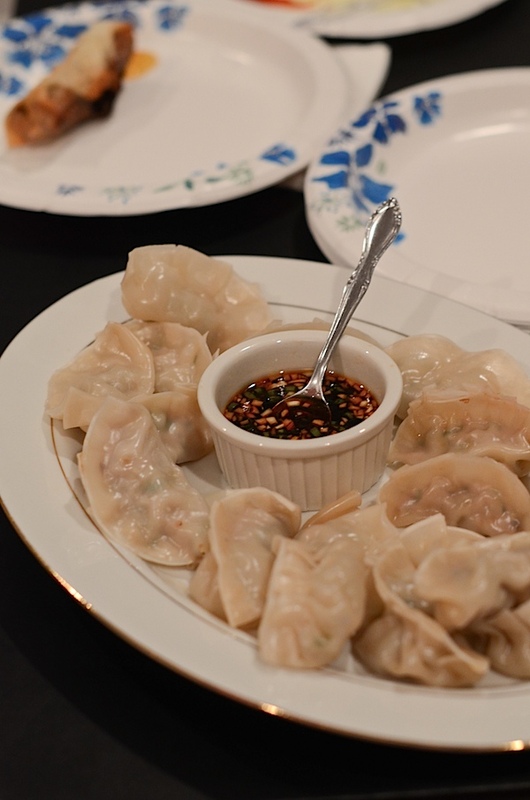 Always wanted to try homemade dumplings! We have a similar dessert to those rice balls made in ginger also! Thanks, Trang! It’s great to hear a long-time reader like you likes the new look! 🙂 I haven’t converted all of the older recipes into print-friendly just yet, but I’m working on it. All of the new ones definitely will be in the new format. Have a great weekend! 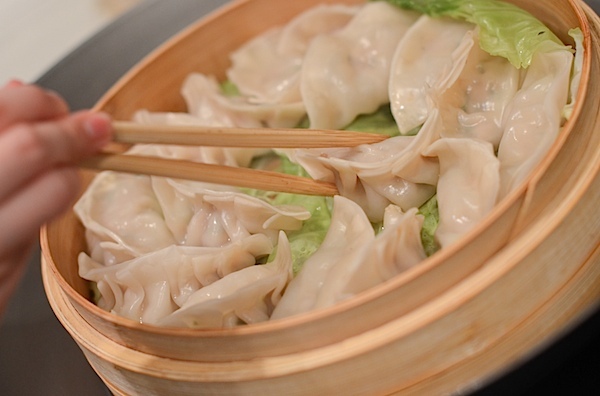 Dim sum is one of my top favorite things to eat. Unfortunately I don’t get to eat it as often as I would like. This was a nice display and one of the best things about making it at home is you know what goes into it ! 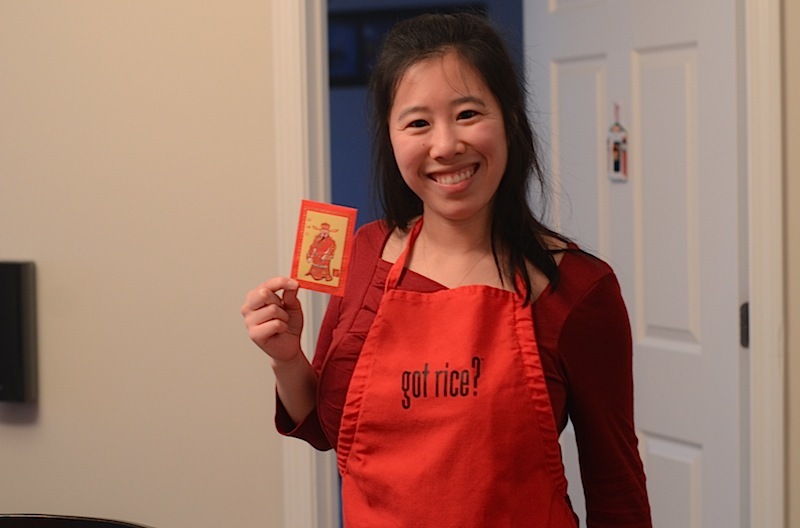 A belated gung hay fat choy !